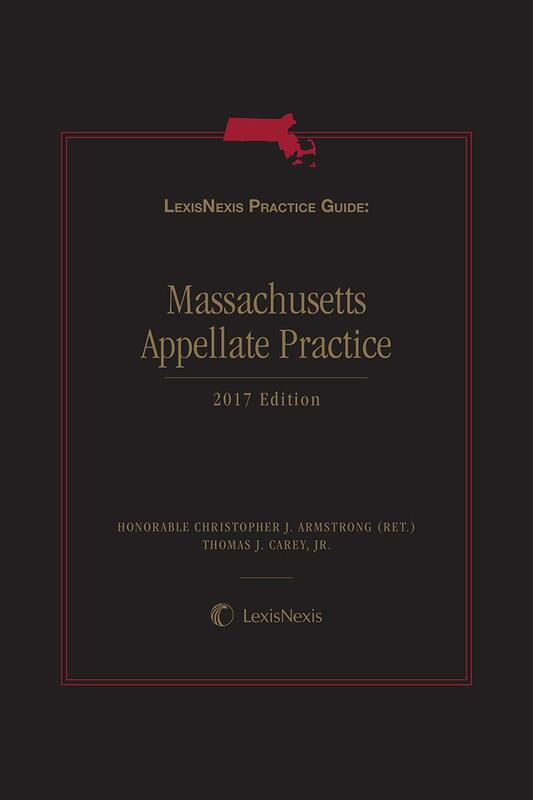 LexisNexis Practice Guide: Massachusetts Appellate Practice is a practice-oriented resource, with invaluable strategic advice, for effectively handling every stage in the appeal process of a case before Massachusetts appellate courts. 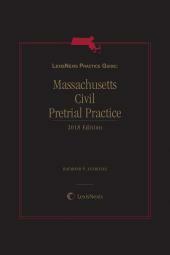 LexisNexis Practice Guide: Massachusetts Appellate Practice is a practice - oriented resource that assists trial attorneys in handling every stage of the appeal process from final judgment in a Massachusetts trial court to rescripts and further proceedings in trial court, rehearing in the Massachusetts Supreme Judicial Court, and appealing judgments to the United States Supreme Court. 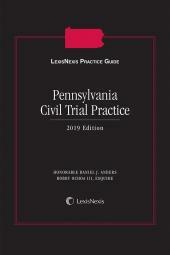 Trial litigators will get detailed step-by-step coverage of the appellate process, as well as practical information about appellate practice in the various Massachusetts appellate courts from Hon. Christopher J. Armstrong (Ret. ), former Chief Justice of the Massachusetts Appeals Court, and Thomas J. Carey, Jr., Of Counsel at Collora, LLP in Boston, where he leads the Appellate Practice Group. 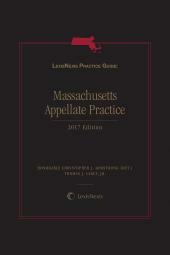 In addition to winning strategies, checklists, legal analysis, and practical guidance, LexisNexis Practice Guide: Massachusetts Appellate Practice includes citations and discussion of key cases, rules, statutory provisions, and procedures necessary to place the merits of a case before a Massachusetts appellate court. THOMAS J. CAREY, JR., ESQ. Justice Christopher J. Armstrong was one of the six original justices of the Massachusetts Appeals Court, appointed to that position by Governor Francis W. Sargent when the court was created in the summer of 1972. He was appointed Chief Justice of the Appeals Court by Governor Paul Celluci in 2000. Under the Massachusetts mandatory retirement law, he stepped down as the Appeals Court's Chief Justice (and as the senior member of the Massachusetts judiciary) in 2006. Thereafter Justice Armstrong served the court for two additional years as a retired recall justice, leaving finally in 2008, having served the Court as a justice for the first thirty-six years of its history. During his tenure, he authored more than 1,100 signed opinions. In 2006, the Boston Bar Association awarded Justice Armstrong its Citation of Judicial Excellence. The Massachusetts Bar Association awarded him its highest judicial award, the Chief Justice Edward F. Hennessey Award for exceptional contributions to the administration of justice in the Commonwealth. 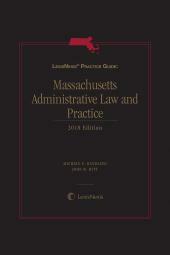 In 2007, Justice Armstrong was named by Massachusetts Lawyers' Weekly as one of thirty-five persons who had most influenced the practice of law in Massachusetts over the previous thirty-five years. Prior to becoming a judge, Justice Armstrong, a graduate of Yale and Yale Law School, was a law clerk in the Superior Court. He lived a year in Nigeria under the Massachusetts Institute of Technology Fellows-in-Africa Program. Upon his return, he served several months as Executive Clerk to Chief Justice G. Joseph Tauro; then, in roughly two-year intervals, as Assistant Legal Counsel under Governor John A. Volpe, Assistant Attorney General under then Massachusetts Attorney General Elliot L. Richardson, and as Chief Legal Counsel under Governor Francis W. Sargent. In 1970, Armstrong was named as one of "Boston's Ten Outstanding Young Men" by the Boston Junior Chamber of Commerce. (The award did not become gender-neutral until 1985.) He was serving as Massachusetts Undersecretary of Administration when he was appointed to the new Appeals Court in 1972 by Governor Sargent. Justice Armstrong was appointed by the Supreme Judicial Court to be the first chairman of the Committee on Judicial Ethics, and served in that capacity for his maximum eligibility, ten years. Justice Armstrong has served as co-chair of the Administration of Justice Committee of the Boston Bar Association, a member of the board of the Massachusetts Law Review, and a member of the Boston Bar Association's Task Force on the Causes of Wrongful Convictions. In retirement, Justice Armstrong is affiliated as Of Counsel with the Boston litigation law firm, Collora LLP. He remains active in the Council of Chief Judges of State Courts of Appeal, affiliated with the National Center for State Courts, as well as in a number of civic and charitable activities in Newburyport and Newbury, MA. Mr. Carey specializes in appellate practice, civil or criminal, in state or federal courts. He is Of Counsel at Collora, LLP, in Boston, where he leads the Appellate Practice Group. He also teaches an Appellate Advocacy seminar at Boston College Law School. He holds a J.D. degree from Boston College Law School, where he earned several academic awards, and an LL.M. degree from Harvard Law School. His distinguished legal career includes federal clerkships with United States District Court Judges Andrew A, Caffrey and Frank Murray in the District of Massachusetts, a decade as a full-time law teacher at Suffolk and Boston College Law schools, government service as the Appellate Attorney in the Major Violators Division of the Suffolk County District Attorney's Office, and private practice. Mr. Carey is a member of the American Bar Association's Council of Appellate Lawyers and its litigation section and is a sustaining member of the Massachusetts Bar Association. He chairs the Massachusetts Bar Association's Amicus Curiae Committee and its Appellate Bench-Bar Committee, and serves on the editorial board of the Massachusetts Law Review. He is a Brandeis Life Fellow of the Massachusetts Bar Foundation. He is also a member of the Boston Bar Association and the Plymouth County Bar Association. A former Director of Advocacy Programs at Boston College Law School, Mr. Carey has long been active in teaching advocacy skills to students and lawyers alike. He has coached championship moot court teams, and frequently lectures at bar association programs on legal writing and appellate advocacy. He created an innovative seminar in Appellate Advocacy in which students handle real life cases and has taught the course at BC Law for twenty-five years. During his career, Mr. Carey has taught and practiced across a broad spectrum of legal subjects, including Arbitration, Administrative Law, Agency and Partnership, Appellate Practice, Civil Procedure, Civil Rights Litigation, Commercial Law, Constitutional Law, Consumer Protection Law, Contracts, Corporations, Criminal Law, Criminal Procedure, Employment Law, Equity, Evidence, Federal Courts and Procedure, Health Law, Land use and Planning, Legal Process, Municipal Law, Probate Law, Property, Torts, and Zoning.